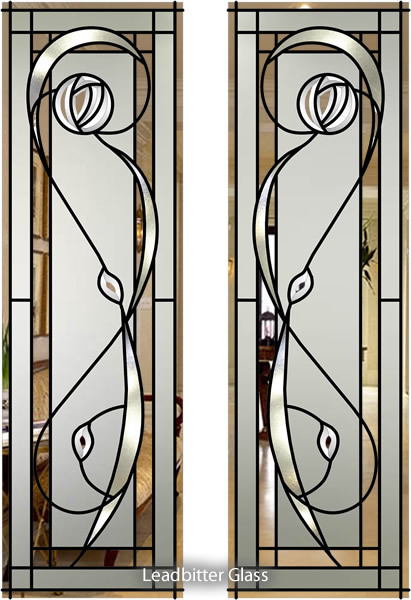 These Mackintosh Bevelled & Leaded designs for windows & doors are one of our most popular styles of glass. We have created many panels in all shapes and sizes based on this bevelled range of designs. 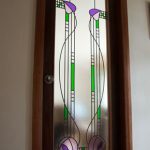 These Mackintosh designs are here for your inspiration so if you like this style, we will be happy to price the style for your specific glass sizes and shape. 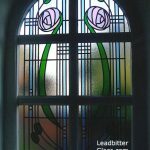 Our latest range of Mackintosh designs are currently being added to the website so why not also take a look at our Fused Glass Mackintosh Gallery. Any of the layouts below can also be ordered in our new Fused Glass style. The curved arcs have a texture overlay to them. The main background is sandblasted with a clear outer border. The bevelled roses and leaves are clear glass. 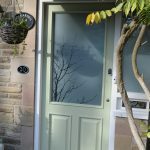 This is displayed as a full height glazed door design. Glass sizes approx’ 510mm x 1700mm. Other sizes are available. 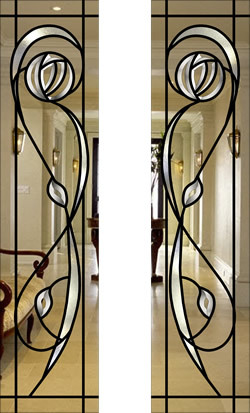 Shown using 610 x 1010 as the glass sizes but as with all of our designs, we can create this style in almost any size. 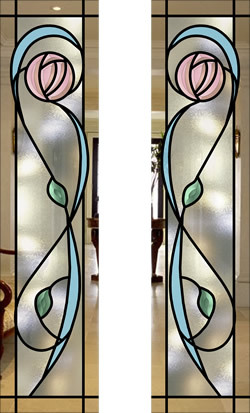 The displayed design is suitable for a half glazed door or feature window. 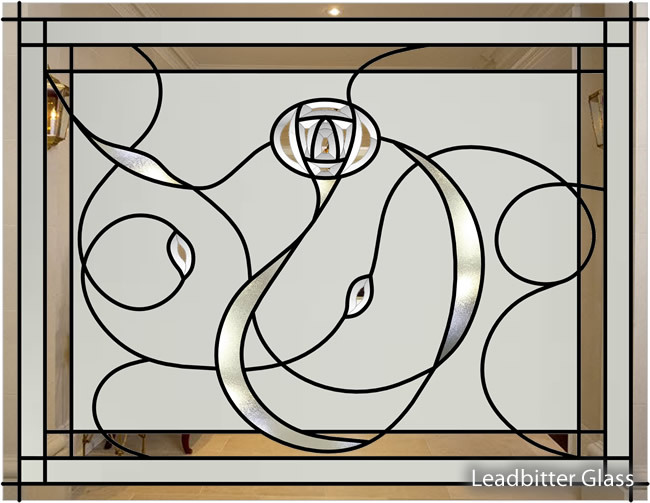 The design is created using the same techniques as above. The straight border, the outer area, bevelled flower and leaves are clear glass. 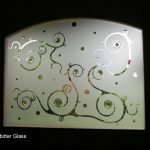 The 3 large curls are textured with a colourless stipple effect with the rest of the glass being sandblasted. Glass size displayed is 979 x 755. 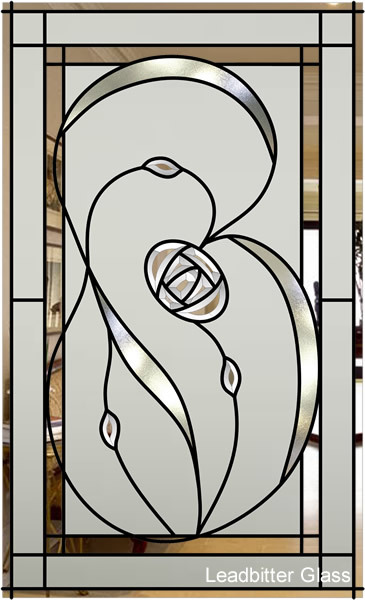 The background of the glass is sandblasted with a clear straight border and clear bevelled glass shapes. This is suitable as a feature window design. The arcs have a colourless texture and almost any size can be created. Glass size displayed is 293 x 962. The main background is sandblasted with a clear rectangle border, then a sandblasted border with a clear outer border. The circle roses and leaves are clear bevelled glass. The curved arcs have a colourless texture and almost any size can be created. Glass size displayed is 609 x 755. This design is similar to the design above but it illustrates how a smaller version may look. 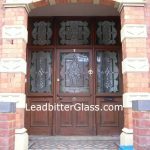 All of the same techniques have been used to create the glass. Glass size displayed is 648 x 343. 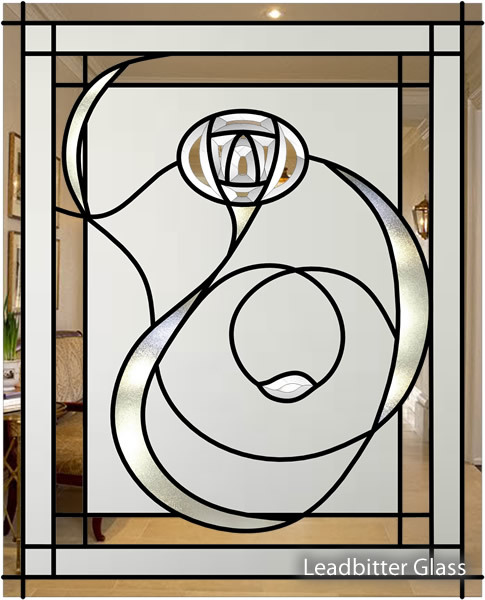 This design shows how we can create one design to run through various panels in the same door. 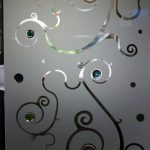 Again the background of the glass is sandblasted with a clear border with clear bevelled glass shapes. The arcs have a colourless texture.